Department of anesthesiology and intensive care, The Netherlands Cancer Institute – Antoni van Leeuwenhoek Hospital, Amsterdam, The Netherlands. All modern vapor anesthetics are capable of carbon monoxide (CO) production as a result of interaction with desiccated strong base containing carbon dioxide absorbents. In desiccated absorbents, desflurane produces the highest concentrations of CO. Sevoflurane is known to produce the nephrotoxic compound A (CA) independently from water content of the carbon dioxide absorbent. The purpose of this study was to register the average CO concentrations in forty patients receiving anesthesia with desflurane or sevoflurane after implementation of a safety protocol adapted from Woehlck et al.. This protocol was developed to prevent desiccation of the strong base containing absorbent Drägersorb 800 Plus®. Methods: In 40 patients a low-flow anesthesia was maintained using an oxygen/air mixture with either sevoflurane or desflurane in combination with the CO2 absorbent Drägersorb 800 plus®. CO and CA production was measured in the inspiratory limb of the anesthesia machine using a portable gas chromatograph, with a sampling frequency of 12 samples per hour. Results: No carbon monoxide was measured in any of the desflurane or sevoflurane anesthesia’s. 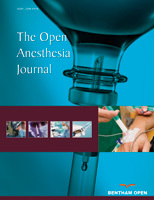 The mean concentration of CA for anesthesia with sevoflurane was 17.1 ± 5.5 parts per million. Conclusion: With the introduction of a safety protocol no carbon monoxide was measured in anesthesia performed with desflurane or sevoflurane. Compound A is almost continuously detected in anesthetic procedures with the use of sevoflurane in very low concentrations. Implementation of a simple safety protocol possibly prevents desiccation of the absorbent and could subsequently reduce the risk of carbon monoxide intoxication.